Walden Shores 5th Annual Bass Fishing tournament held at Rickert Properties Premier Waterfront 55+ Community on Saturday the 2nd was magnificent! Congratulations to Dale Johnson and Frank Tennity on 1st Place along with Randy Morris and Aubrey Dawson on 2nd Place & Big Bass and Cody Wilson and Howard Mathews on 3rd Place. The Johnson/Tennity Team brought in 5 fish for a total weight of 13.33 pounds, Morris/Dawson Team 3 fish for 12.03 pounds with Big Bass weighing in at 9.38 pounds and Wilson/Mathews Team with 5 fish for 11.09 pounds. Our Resident longest fish caught contest was won by Steve Redwine with 17 ¾ inches, he received one month’s FREE lot rent! Great job to all of our anglers! On behalf of Rickert Properties and Walden Shores we’d like to thank our Gold & Silver Sponsors and especially our Primary Sponsor Texas Aquatic Harvesting for providing the wonderful BBQ lunch! Thank you to all of our residents & friends that came out to share in this beautiful day! Walden Shores 4th Annual Bass Fishing tournament held at Rickert Properties Premier Waterfront 55+ Community on Saturday the 3rd didn’t disappoint! Congratulations to Kevin Stenzel and Cindy Stenzel, residents of Walden Shores and our 1st Place & Big Bass winners along with Bob Lane and Harry Bradley on 2nd Place and John Cox and Alan Clark on 3rd Place. The Stenzel Team brought in 5 fish for a total weight of 14.39 pounds and their Big Bass weighed in at 10.74 pounds. Lane/Bradley – 5 fish for 11.45 pounds and Cox/Clark – 5 fish for 11.41 pounds. Our Resident longest fish caught contest was won by Kevin Stenzel with 25 ½, they received one month’s FREE lot rent! Great job to all of our anglers! On behalf of Rickert Properties and Walden Shores we’d like to thank our Gold & Silver Sponsors and especially our Primary Sponsor Texas Aquatic Harvesting for providing the wonderful BBQ lunch! We had over 90 spectators cheering on our anglers, winning door prizes and enjoying the fabulous February Florida weather! 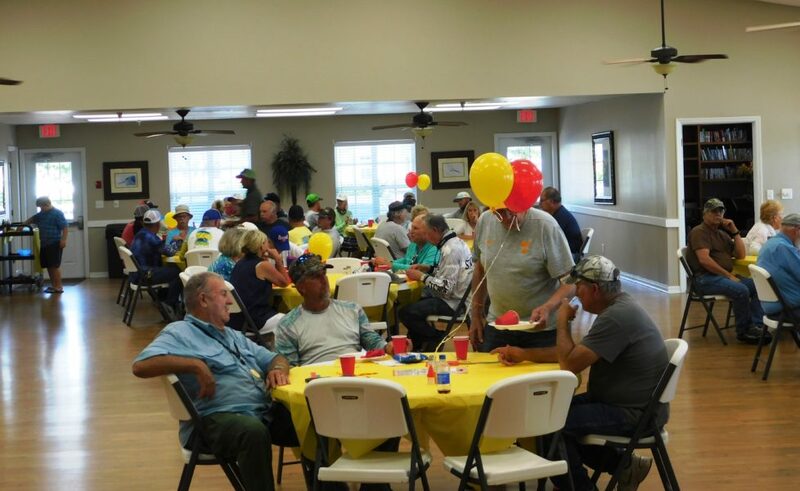 Awards were presented by Barbara Isaacs and Nancy Marion from Rickert Properties Inc.
Walden Shores 3rd Annual Bass Fishing tournament held at Rickert Properties Premier Waterfront 55+ Community on Saturday the 11th was a HUGE SUCCESS! Congratulations to Sammyjay Acree and Rick Hurst our 1st Place & Big Bass winners along with Matt Faneauf and James Melvin on 2nd Place and Wade Harrell and Bill Lingan on 3rd Place. The Acree & Hurst Team brought in 5 fish for a total weight of 20.02 pounds and their Big Bass weighed in at 10.83 pounds. Faneuf/Melvin – 5 fish for 7.96 pounds and Harrell/Lingan – 5 fish for 7.51 pounds. Our Resident longest fish caught contest was won by Jerry Steen with 14 ¼”, he received one month’s FREE lot rent! Great job to our youngest winner Sammyjay Acree who belongs to an elite group of junior angers for Lakeland Junior Bassmasters! On behalf of Rickert Properties and Walden Shores we’d like to thank our Gold & Silver Sponsors and especially our Primary Sponsor Texas Aquatic Harvesting for providing the wonderful BBQ lunch! We had over 80 spectators cheering on our anglers, winning door prizes and enjoying the beautiful Florida weather! 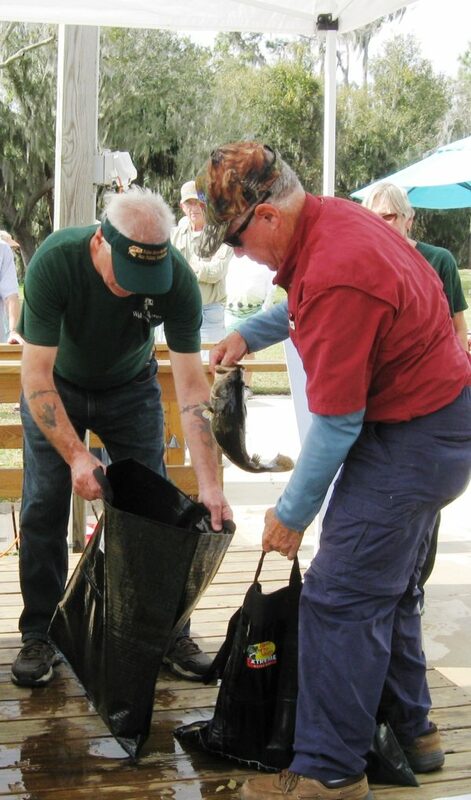 It was a triumphant day at Walden Shores 2nd Annual Bass Fishing Tournament held on lake Walk-In-Water on February 20th. Congratulations to Leslie Murphy and Ed Birkhimer our 1st Place & Big Bass winners along with Wade Harrell and Bill Lingan on 2nd Place and Matt Faneuf and James Melvin for 3rd. The Murphy & Birkhimer team brought in 5 fish for a total weight of 15.94 and big bass 7.90. On behalf of Walden shores and Rickert Properties we’d like to thank our Gold & Silver Sponsors and especially our Primary Sponsor Texas Aquatic Harvesting for providing the wonderful BBQ! We had over 50 spectators cheering on our anglers, winning door prizes and enjoying the beautiful Florida Weather! February 7, 2015 – Walden Shores 1st Bass Fishing Tournament was sensational!!!! Congratulations JP Vaughn & Cole Wilson on 1st Place, Wayne Montogomery & Don Smith on 2nd and Dale Johnson & Frank Tennity for 3rd Place & Big Bass! On behalf of Walden Shores and Rickert Properties thank you to our Gold & Silver Sponsors along with everyone who came out to cheer the Anglers on! Looking forward to next years!